Some acts are small, powerful moments that ultimately ripple around the world, such as Malala Yousafzai. Some women are prominently forging new paths from the corner office, such as Sheryl Sandberg or Janet Yellen. And some women lead at the grocery cart. Yes, that’s right-the grocery cart. The more I think about it, the more I see that Beyonce is right: Women, who rule the world? We do. This Saturday is International Women’s Day. Which has me thinking about all of the inspiring national and global figures who remind me that there’s immense power to finding your voice, and to wielding your power “from whatever size stage God has given you” - as Oprah said to me once. And rather than a feel-good sounding moniker that’s soft on substance, womenomics is about power, and about making good business decisions that can change the marketplace. Here’s the surprising truth. We women do most of the buying. In fact, we control roughly 80% of consumer spending. That gives us enormous power. Which means that our best resource to change the food system doesn't lie with Washington - or even with companies - it lies with us. We are our own most underutilized resource. This is a profound revelation, and frankly, it’s one that many companies are hoping we don’t figure out. But we have. Or at least, we are starting to. So how can we wield our considerable collective influence to press the levers that matter most for fixing our food system and keeping our children healthy? (if you doubt companies’ ability to change quickly in response to consumer demand, consider the current surge of gluten-free products at the grocery store). To me, this is one of the most pressing crisis looming for our food system. In fact, at the risk of sounding dramatic, it threatens to unravel modern medicine as we know it. And it is something that isn't even required to be listed on a food label. Over 70% of all antibiotics are being used on industrial farms :subtherapeutic, low dose antibiotics produce meat faster and more cheaply, and help compensate for crowded, unhygienic conditions. Yet the science has become clear - we are accelerating an antibiotics crisis. Here is an excellent evidence-based summary of the issue. In fact, the Pew Charitable Trusts have compiled such compelling science on the impact of the misuse and overuse of drugs in factory farming, they've launched the Pew Campaign on Human Health and Industrial Farming to preserve the effectiveness of antibiotics for all of us. A recent report from the NRDC even found previously undisclosed FDA documents showing that feed additives don't even meet the agency's own safety standards. 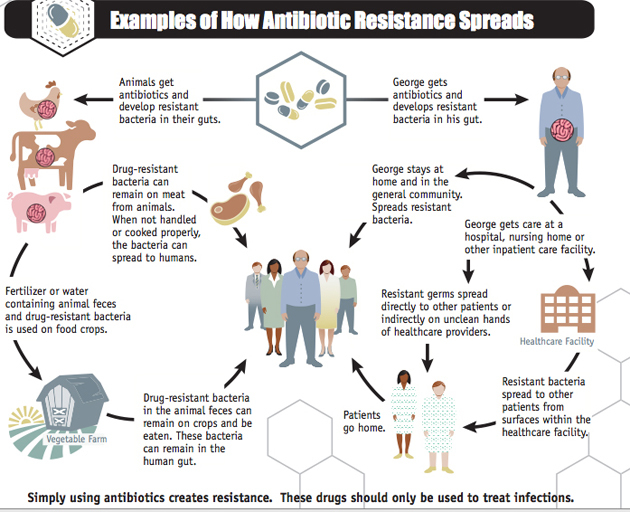 And you don’t have to be a meat eater to be concerned about drug resistant bacteria: research is finding people who live nearby these large farming operations are also at higher risk of MRSA. As a parent, the notion that we are dangerously close to returning to a time when we lack the drugs to fight common childhood mishaps such as strep throat or a skinned knee terrifies me. As a nutritionist, I see that it falls squarely on my plate - because antibiotics are used to produce much of the conventional milk, meat and poultry products we put in our grocery carts, and order from restaurants and foodservice operations. As women, science has zeroed in on some key differences in the ways our brains work: we are hard wired for collaboration. For finding common ground. For building consensus. For compassion. And for considering risk. (In fact, one famous comment made during the last Economic Forum in Davos noted that “Lehman Brothers may not have fallen so far so fast had there been a few sisters around”). Far from being soft skills, they are some of what enables to find our voice-and the conviction to forge powerful new paths forward. While Washington drags its feet on meaningful fixes, womenomics is hard power- a roadmap to tell companies clearly and consistently a simple message: We want better from the food system. From the companies we trust to feed our children. And we are prepared to spend our dollars somewhere else (namely, on brands that choose to go antibiotic-free, or a restaurant serving animal products produced without low doses of antibiotics). It can be done. Read this piece to see how the Netherlands - a country with a similar dependence on antibiotics for industrial farming - is reaping real benefits from making the switch. Here are 4 simple steps to get you started. Will you join me? I hope so. Invest in the Best: Buy only meat, poultry and pork that is certified Organic, Certified Humane, or has a USDA “Process Verified’ antibiotic claim (explained in the EWG’s Meat Eater’s guide here). To afford the higher price tag, choose smaller portions and serve with robust servings of vegetables and legumes, and enjoy plant based meals (no meat or a little meat) a couple of nights a week. Spend Strategically: Spend food dollars on foods-and at restaurants-that serve antibiotic free meat and poultry. Many chains that are trying to source such products, such as Chipotle, will display this on their menu or website). Make Your Voice Heard: Speak up on social media! Or sign this petition asking the FDA to insist on responsible antibiotic use in agriculture. Think it’s not possible to drive change from the ground up? Check out how this food blogger convinced Chick-fil-A to go antibiotic free. Empower Women Globally: Look for the Fair Trade Certified seal on coffee, chocolate, tea and other products to help women around the world tap into their power. How are you using Womenomics to change the way you eat? I'd love to hear from you!